On March 26, the top court had extended the relief against arrest to Karti Chidambaram till April 2. 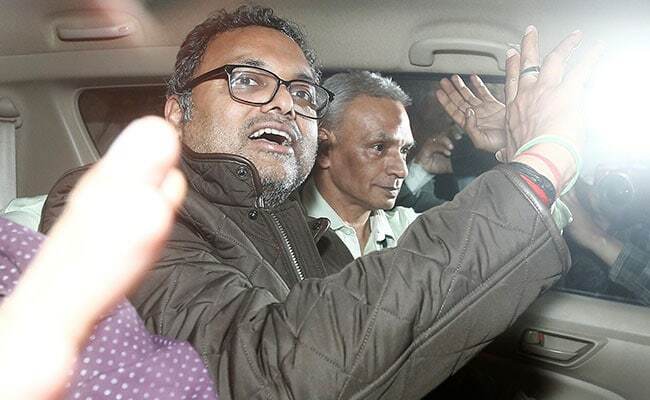 New Delhi: The Supreme Court on Monday extended the interim protection against the arrest of Karti Chidambaram till April 27, granted by the Delhi High Court in the INX Media money laundering case. A bench of Chief Justice Dipak Misra and justices AM Khanwilkar and DY Chandrachud is hearing the plea of the Enforcement Directorate (ED) seeking an authoritative pronouncement from the top court in view of conflicting orders of different high courts on the probe agency's power of arrest under section 19 of the Prevention of Money Laundering Act (PMLA). The bench, meanwhile, adjourned the hearing on the plea of ED to April 27 and said that the protection against arrest to Karti Chidambaram stood extended till that day. Additional Solicitor General Tushar Mehta, representing the ED, had said that the probe agency has been armed with the power of arrest under the statute, keeping in mind the several international conventions underlining the need to curb money laundering generated from drugs smuggling, terror financing and black money routing. Tushar Mehta had referred to the 1988 UN convention and had said the member countries felt the need to have a law to deal with the offence money laundering. The advent of e-commerce has made investigation into money laundering more difficult as ill-gotten wealth has been transferred to all corners of the world very conveniently after the globalisation, he had said. Initially, the top court, on March 15, had given the interim relief to Karti Chidambaram and had said it would clear the "confusion" which has crept in due to the divergent views of different high courts on ED's power to arrest. The top court had also transferred to itself the matters pending before the Delhi High Court relating to the power of ED to arrest in money laundering cases and also a plea filed by Karti Chidambaram seeking protection from arrest in ED's case. The top court had said it would answer the question about interpretation of section 19 of the PMLA relating to ED's power to arrest and also deal with the issue whether high courts can grant protection from arrest on a plea under Article 226 of the Constitution which deals with high court's power to issue writs and orders. In a plea filed before the high court, Karti Chidambaram had sought striking down of ED's power of arrest under section 19 of the PMLA, besides seeking quashing of the enforcement case information report (ECIR) and the probe being carried out by the agency. In a case lodged by the CBI in connection with the INX Media corruption case, the high court had granted regular bail to Karti Chidambaram on March 23. He was arrested by the CBI on February 28 in Chennai immediately after he returned from abroad. An FIR by CBI, filed on May 15 last year, had alleged irregularities in the Foreign Investment Promotion Board (FIPB) clearance to INX Media for receiving Rs 305 crore in overseas funds in 2007 when P Chidambaram was union finance minister.